Update 09/08 dropped ANOTHER £12! 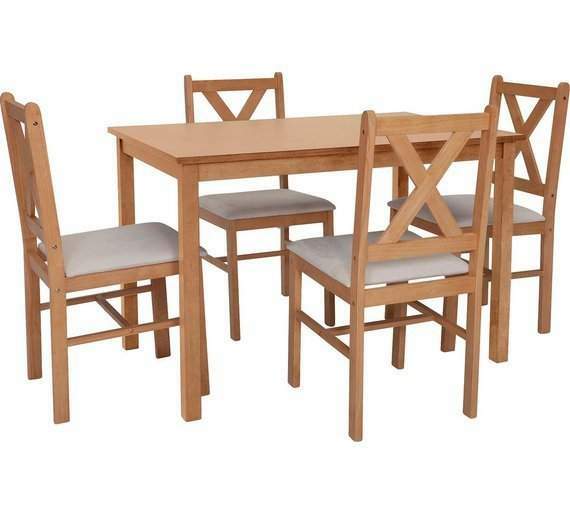 From the Ava collection, this dining set will bring a bright new look to your dining room. The tabletop is made from rubberwood veneer with solid oak legs, and the chairs are solid wood frames with cream seat pads. This Ava table and cream chairs are perfect for a modern home. Solid oak and oak veneer table. Size of each chair H88, W52, D48cm. I've got this. Was bought originally as a short term purchase until we could afford something better but still going strong. Very hard-wearing and durable.. Screws on the seats need tightening couple of times a year. 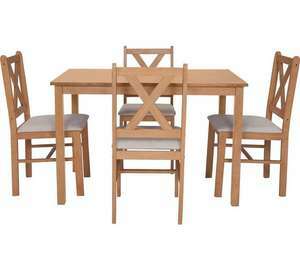 "The tabletop is made from rubberwood veneer with solid oak legs, and the chairs are solid wood frames with cream seat pads"
Says not available in any stores for click or collect if you select happy to travel.